Description: Flint. 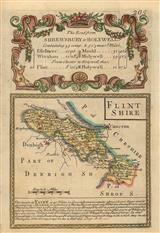 A fine map of the county from the second edition of Speed's seminal atlas, 'The Theatre of Great Britaine'. Vignettes of Flint, St. Asaph, and St. Winfred's Well. Description: County map after Saxton. Decorative strapwork cartouche. Coloured. 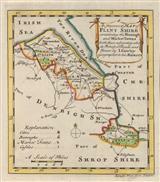 Description: County map containing the borough and market towns. Coloured.